Remember the quince recipe I shared last week? I had a couple of them leftover and thought about turning them into a jam. In all honesty, though, I have a lot of jam from the abundance of sweet strawberries we experienced here in California, so I’m sort of over jam at this point (but talk to me in a month or two). I was just about to create a galette with them when I got a better idea to create quince paste. 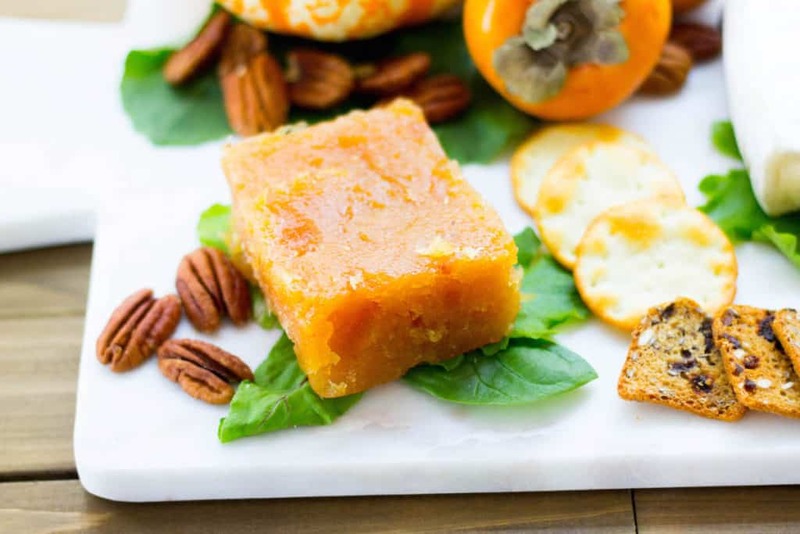 I was writing my shopping list for a gathering I was hosting this past weekend and was scribbling down cheeses when I suddenly remembered reading about quince paste and how wonderful it is with cheese. And so I created this holiday cheese board with quince paste. 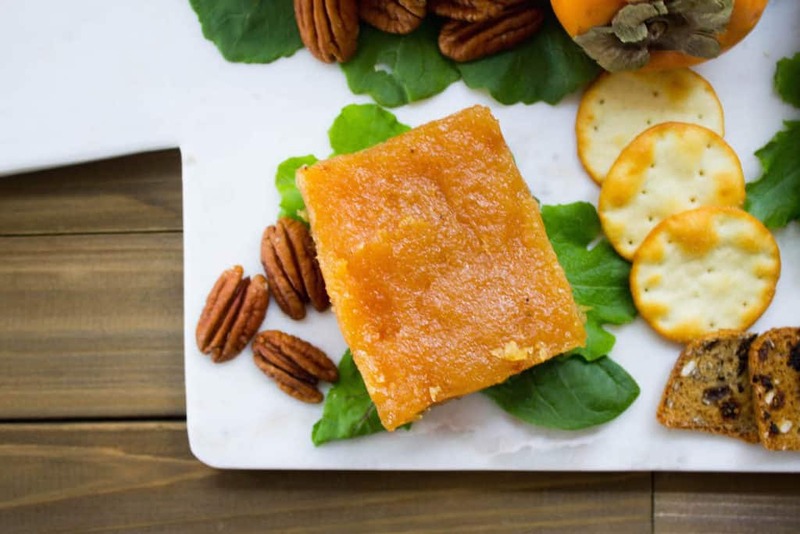 In France, more specifically Provence, the French have a tradition of serving quince paste (pâte de coing) with various cheeses for the holidays. Quince paste has even been called quince cheese, as it’s shape and form allows it to be sliced very much like a soft cheese. When quince is cooked, it develops this orangish-red hue and becomes beautifully sweet. The harsh tartness you would have tasted while it was raw actually becomes subdued and enjoyable. A splash of fresh lemon juice in the paste highlights the sweet and tart notes of the quince and contributes towards creating a lovely addition to any holiday cheese board. As with any spread for a holiday cheese board, I like to include two to three cheeses. In this case, because I included the quince paste, I chose to pair two cheeses: one hard, one soft. 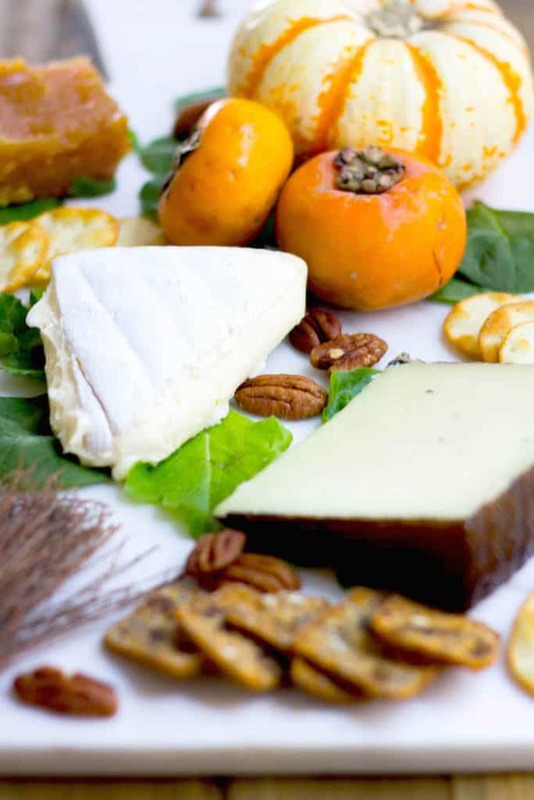 My favorite hard cheese to include is manchego, a nutty-flavored Spanish cheese. It’s absolutely divine, especially with the quince paste. For the soft cheese, I usually display a creamy brie because of its universal appeal. It’s also a cheese that goes well with many extra toppings or spreads, including the quince paste, which is the perfect sweet and tart addition to any cheese board. During other times in the year, I like to use foods like wine jelly, fresh blackberries, and other fruity additions that will provide the same delightful mix of sweet and tart. 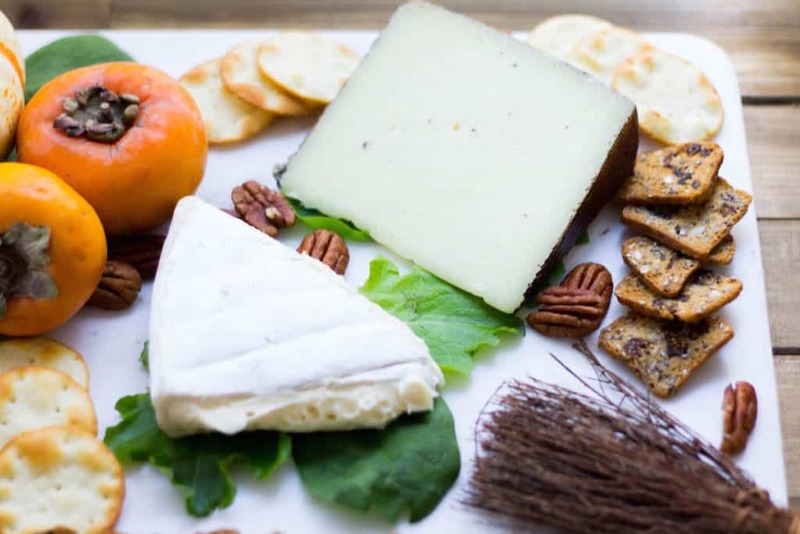 An assortment of crackers is always a welcome accompaniment to cheese and should be the opposite of those bland crackers you might find yourself eating when you’re feeling under the weather. Like these pita crackers and fig and olive ones, try to choose crackers that are so tasty, they could happily be eaten on their own. The final touches to any holiday cheese board are festive elements. In this case, I included a pumpkin, seasonal fruit like persimmon, and a cinnamon whisk (which could easily be swapped for cinnamon sticks). With a cheese board as appetizing as this, it’s hard to imagine any guest being anything less than pleased at your party! To a medium pot, add the quince wedges and lemon peel, then cover with enough water to just about cover the quince wedges. Bring the water to a boil over medium heat, then reduce to medium low and let the quince cook for about 20 to 30 minutes, or until the quince is fork-tender. Drain the excess water from the pot before using an immersion blender or food processor to purée the quince and lemon peel together. Return the mixture back into the pot if you used a food processor. 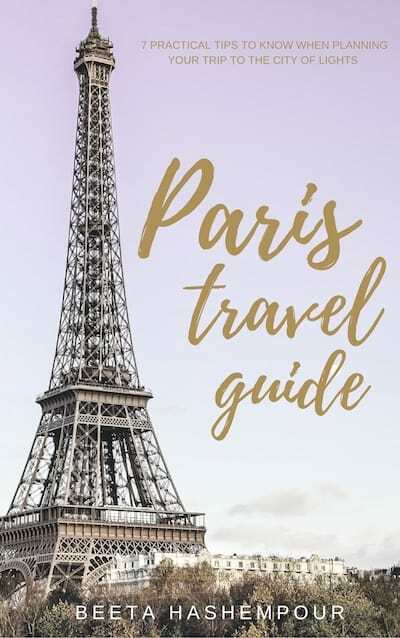 You should end up with about 1 heaping cup of purée, therefore, add 1 cup of granulated sugar to the purée as well as 2 to 3 tsp of lemon juice, depending on how small your lemon is. Cook this mixture together over low heat for about 2 hours, or until the quince has developed an orange color and is very thick in consistency. It should clump together and not flow off your spoon like a jam would. Line a small square pan or round pan with a sheet of parchment paper. How small or large your pan is will determine the height of your quince (see notes at end). Transfer the quince paste into the prepared pan and bake your quince at 120°F for 1 hour to allow the paste to set. Afterwards, cover the paste with a sheet of plastic wrap and refrigerate overnight. When ready to serve on cheeseboard, use a sharp knife to slice off the very edges of the paste to ensure a perfectly neat block of paste sans any of the dried up edges. To prepare the cheese board, fan our your mixed greens on various parts of the board to act as “coasters” for the cheeses and quince paste. Place the festive items like the pumpkin, persimmon, and cinnamon whisk off to the corners of the board. Place the cheeses near the center of the board, and the crackers along the perimeter. Set the quince paste off to one side with space for a sharp knife to be used with the paste. Scatter pecans in empty spaces on the board for a finishing touch. For the quince paste, you can reserve the quince’s peel and core and tie them in a cheesecloth or muslin wrap and stew this with the quince and lemon peel as the quince cooks until tender. This will contribute to the quince achieving a darker orange-red hue. For the pan, I used a 5 1/2 inch mini loaf pan, and only distributed the quince paste into half of the pan to achieve a tall block. So delighted to see that you’ve created several recipes with quinces too! They are highly unappreciated here in England- is the same in the States? My gardener had collected an unwanted few from someone else’s garden so I made them into quince paste. Your beautiful photos are making crave manchego with it – the salty-sweet works so well! Love the colour combo you’ve used for your cheese board too- they normally look so dull but yours look so deliciously eye catching! I want to come over and help you eat all the cheese on that board! Looks gorgeous Beeta! What a treat for guests.. or just for me. hehe! I’m so glad you reminded me of a cheese board, Beeta! I’ll be doing a bit of entertaining through the holidays… and would you believe, I always forget about a cheese board! So simple yet so appreciated and delicious. Your quince paste sounds just fabulous. I always love pairing something sweet with cheese. We’ve got a small wine/cheese/gourmet shop around the corner so I’ll have to make a trip there to see what hard and soft cheeses I can collect! Thank you for this my dear. I’d love to share this platter with you while sipping a most delicious red! Oh this is so gorgeous Beeta.. I have been looking for quince everywhere around here and can’t find it. Lucky you! 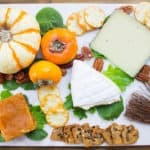 This cheese board is perfect for the holidays. So beautifully styled as well. This is such a beautiful cheese board, Beeta! I love all the different pairings here! So delicious and festive for the holidays! The quince paste sounds amazing too!